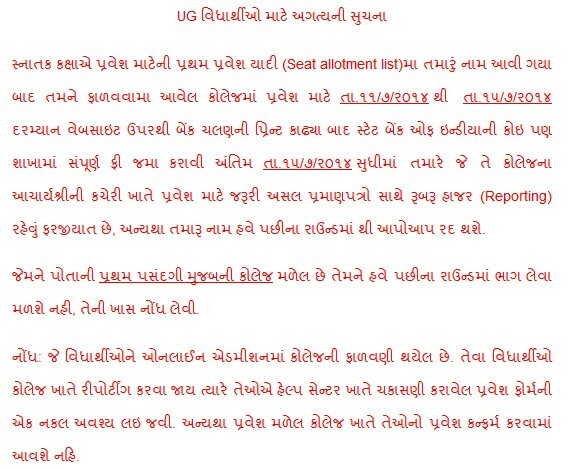 Gujarat State Agricultural Universities Common Admission Announced Under Graduate Students Important Notification and GSAUCA UG First Merit List 2014 on 11 July 2014. Candidate Can Check Your name In First Admission List (Seat Allotment List) on Official Website www.gsauca.in. After check you can print Bank challan and Submitted fee at any State bank of India Branch From 11 July 2014 to 15 July 2014 for Admission in to Allotted Collage. Candidate Must check their original certificate at collage. Any wise your name cut for second round. Who according to his choice of college they all not applied for second round. how to check GSAUCA UG First Merit List 2014 ? Now Click on UG First Merit List Link. Then Check Merit and Download Admission Fee Challan.